A new drama takes a trenchant, soldier's-eye view of Iraq. Whenever a film about war doesn't explicitly address the causes of war, or its morality, some critics will say that film "avoids politics." But of course any film about war is unavoidably political, both in what it says and what it doesn't. Kathryn Bigelow's lean, trenchant drama The Hurt Locker begins with an epigram by journalist Chris Hedges, about war's appeal to warriors: "War is a drug." In Hurt Locker, the key addict is Will James (Jeremy Renner), who in 2004 reports to Baghdad to replace a bomb-squad leader killed in action. Staff Sgt. James has defused nearly 900 bombs, we learn. Supremely confident in his skills, he flouts such safety-first protocol as letting a remote-controlled robot investigate potential roadside bombs before he does. But if James' seeming recklessness infuriates his cautious sergeant, Sanborn (Anthony Mackie), that's just part of a larger tapestry woven by Bigelow and screenwriter Mark Boal. This is a picture of U.S. soldiers in occupied Iraq: a high-tech, guerilla-versus-standing-army conflict where cultures clash, and any bystander might hold the cell-phone detonator that ends a multitude of lives. 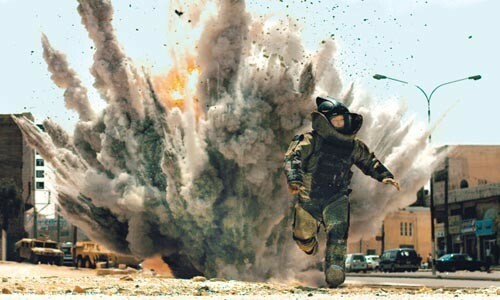 Hurt Locker is full of action and tense moments, from dubious forays through eerily evacuated, trash-strewn city streets to a desert shootout where guerrillas seem everywhere and nowhere. Bigelow (Strange Days) keeps the camera close to her main trio of fighting men, also including an uneasy young soldier named Eldridge (Brian Geraghty). But emotionally her approach is less sentiment than empathetic analysis. Hurt Locker's contrasty look and often near-documentary feel complement its artier cinematic visions: the hellishly flaming wreckage left by a night-time bombing; a death depicted through an image of a weirdly cocked thumb. It all communicates the kind of intimacy that arises among men who seldom articulate their feelings about the toll exacted by repeated stresses, frequent mayhem and convulsively sudden death. Depicting that toll fairly, and soldiers as flawed people with doubts and fears as well as triumphs, deepens our understanding of war. Still, Hurt Locker probably won't change anyone's interpretation of current events. For instance, James might meet a sympathetic Iraqi on an illicit detective mission -- and get treated as roughly as any potential enemy combatant on his return to base. But the film's soldiers'-eye view means that audiences inclined to regard Iraqis as sneaky miscreants are as likely to have their prejudices confirmed as are those who consider them merely wary, beleaguered survivors. Thus the filmmakers' most political choice might be simply their selection of subject matter. Because while Hurt Locker is a fine film about Americans occupying Iraq -- and the difficulty some have returning to dull civilian life -- it is of course the Iraqis themselves who are this war's biggest victims. That's easy for Americans to forget, and we probably can't count on Hollywood to remind us.